"Mrs. Astor's regal poise, so frequently noted by breathless society editors of the day, as often as not was caused by the great brackets of diamonds overspread on her back, which prevented her from sitting back in her chair." 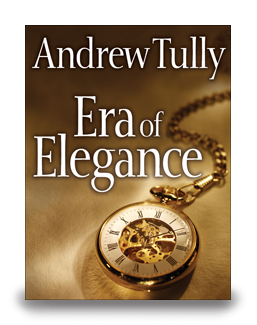 Era of Elegance is a fascinating chronicle of the New York rich during a period that stretched between 1865 and 1914. Most, though not all, lived with a level of lavishness, power, and social dictatorship beyond imagining. They built mansions of spectacular luxury, often occupying several city blocks, and filled them with priceless paintings and furniture from around the world. Once their mansions were built, they were expected to entertain extravagantly and most willingly complied. We caught glimpses of the lives of the very wealthy in old movies and novels and, in Andrew Tully's book, the minutia of their lives and homes - weddings and parties and banquets - is sprinkled before us like glitter on a holiday ornament - it catches the eye and, if not always in good taste, it definitely dazzles. "Some of these people were Society - some were not. But they shared two things - great wealth and an inclination toward elegant living."